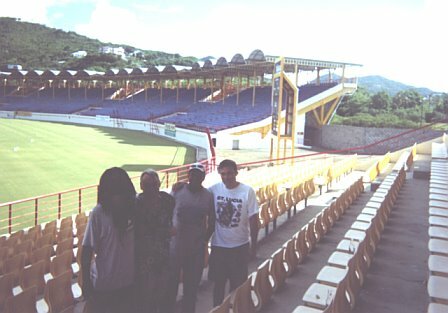 It was on the last day of a family holiday in St Lucia last year when I snuck off during the mid-afternoon to the Beausejour Stadium, which is one of the Stadia used for the West Indies cricket team and the home ground of the Windward Isles. 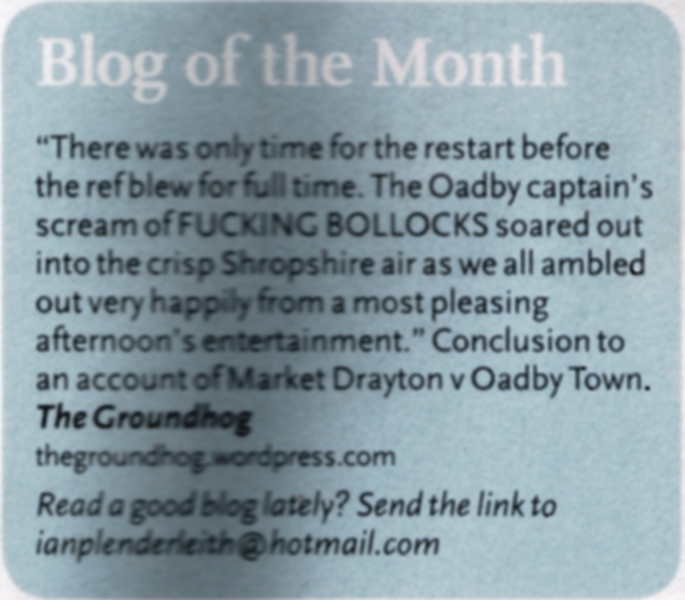 I had been dropping hints about it for nigh on two weeks to no avail so had to take some positive action of my own. I sought out the taxi driver Starry (someone we’d used before and got to know – it seemed to be a custom at the resort to use the same driver when going anywhere) from the hut opposite our accommodation while my wife and two small boys had a siesta. I was slightly embarrassed when I asked him if he’d drive me to the stadium, hang around while I took a few snaps, and drive me back again. He said it would be no problem. I breathed easy now. The whole holiday I been worrying slightly that I might not get the opportunity, but now I was on my way. Taxis weren’t cheap here and it was a good 15 miles but I thought To hell with the expense – it’s gotta be done.Starry was a interesting chap and the drive to the stadium was a pleasure, listening to him chat about island life. I could have sat there all day. About 10 miles out of the resort you come to what in the UK would be classed as a village.You turn left here to the stadium, which is nestled is a verdant bowl. 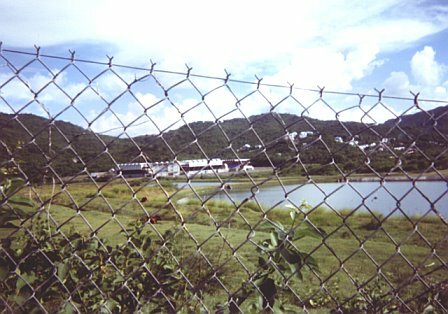 It was difficult to imagine a ground in a more scenic setting. I got my camera out and took this pic from the taxi. At this stage I was still expecting just to hop out while Starry left his engine running and furtively take a few outside shots and get back in. Well, Carlsberg missed out on an opportunity here because it tuned out to be probably the best stadium tour in the world. We pulled up in the car park alongside half a dozen other cars to a lot of activity. Starry spotted a friend of his rummaging in a boot with cricket gear and talked to him a bit, while I hung about. It turns out we were just in time for the Island’s equivalent of the Natwest Trophy – it was the semi-final between Soufrière and Gros Islet. What perfect timing! Starry asked his friend if we could come and watch. He led us through the gates quite happily. Despite this being a national semi-final there didn’t seem to be anybody except the actual players and us. In typical English fashion I was a bit concerned that maybe Starry’s ‘meter’ was still running and this was costing me a fortune, but then again he didn’t have a meter and this was the Carribean. Everything that’s said about the Carribean pace of life seems to be true. Starry led me round the pitch once and then we settled in some bright yellow seats in one of the stands. We were just in time for the two teams coming out to a total crowd of no more than 100. In the stand to the left of us there was a posse of quite vociferous supporters, of which team I’m unsure. Starry asked if I wanted a beer. By this time we were joined by a big rastafarian who turned out to be the ground keeper and quite patently mad as a fish. He had the biggest and most matted dreadlocks I’d ever seen, a Carribean voice as deep as Barry White and he kept up a constant commentary on the game from the start to when we left. 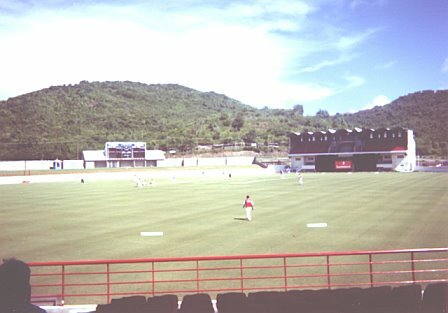 Between overs he turned to us which now included an ex-pat called Piers and talked St Lucian, Windward Island and West Indian cricket with a knowledge and understanding that was surely the most comprehensive on the whole island, if not the West Indies itself. Listening to him with that backdrop and a beer on the go and suddenly cricket seemed a lot better in my eyes.The Carribean is suited to the game, on account of its much slower pace of life. It don’t think it works over here, with noone ever having more than a couple of hours to spare. I’d never shown much interest in the game and had only ever been to one live match, Sussex v Somerset in the early eighties. Despite Viv Richard’s best efforts I never cared much for it after that. This, though, I could get used to! 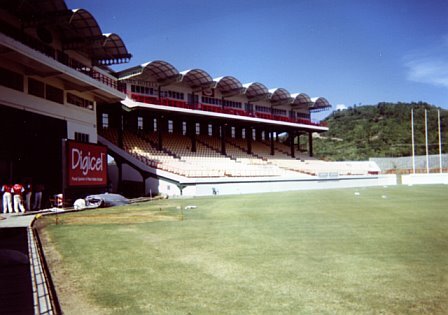 The Digicel sign is where we were let in and where the players emerge from. That stand had maybe a dozen supporters in near the top. I love the roof and the little row of top tier seats underneath it. Moving round, over on the left far side there were no stands, just the scoreboard, which is visible in the first photo. Actually the first pic gives a slightly better showing of the small stand. This final pic shows the main stand a lot clearer. After another beer (payed for by Starry again!) and about an hour later I unashamedly asked for a group photo of (from left to right) the Rastafarian Groundsman(who’s name I never got, I don’t think he answered questions that weren’t cricket related), Piers, Starry and myself. When we left I think Sougrière were on top. 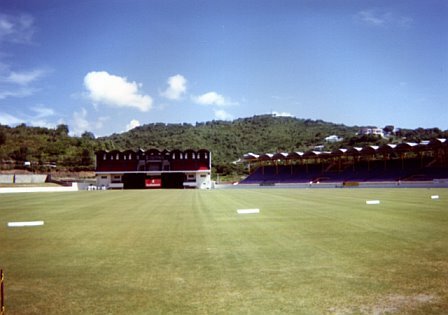 They would meet the winnner of the other semi, which was a local derby between Castries Central and Castries South. That’s what I call a Stadium Tour!